Back from Las Vegas, I find that it has been a bumper week for technology news in the UK. Ofcom has revised the terms under which 4G mobile broadband will be rolled out, ensuring that 98% of the country will get coverage - though worries remain about how far the UK has fallen behind. Virgin has doubled the speeds available to its broadband customers. And the US movie streaming giant Netflix has launched in the UK, providing new competition to Lovefilm. But for me the biggest news I've missed has been of a significant victory for the campaign to improve the teaching of computing and technology in schools. The announcement that the current ICT curriculum is to be scrapped and teachers set free to use more creative methods comes after some brilliant and imaginative lobbying by a few dedicated individuals. In his speech this week at BETT - the computing in schools fair - the Education Secretary Michael Gove appeared to accept in its entirety the argument that ICT had become little more than training in office skills and something far more rigorous was required. The "programme of study" which teachers in English schools have had to follow in ICT would be scrapped and they would be free to use the "amazing resources that already exist on the web". The focus now, said Mr Gove, would be on investing in the training of teachers rather than on buying expensive hardware that could soon be obsolete. Now I've been getting a few messages from people suggesting that there really wasn't much to Mr Gove's speech - "never known so many words say so little" was one critic's view. True, the government appears to be saying to schools "we've lost the plot when it comes to ICT, so please just go away and get on with it". But many independent-minded teachers will surely welcome that. Top of the list, Ian Livingstone and Alex Hope. Their Next Gen report on boosting skills for the games industry - described as "superb" by Michael Gove - made very few headlines when it was published last February. Back in October Ian Livingstone told me he wasn't even getting a hearing at the Department of Education. 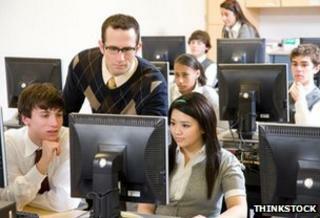 Now the report is seen as a new template for computing skills education. And while Alex Hope's slogan "coding is the new Latin" did not appeal to some, it must have appealed to the classicist in Michael Gove. Then there's Eben Upton who came up with the Raspberry Pi project to make a very cheap computing device for schools, and games industry legend David Braben, who has done so much to promote the idea. He came and showed me a prototype of the device last May, and the reaction to a short video we made showed how much untapped enthusiasm there was for some kind of successor to the BBC Micro. The Raspberry Pi - "a great example of the cutting edge of education technology happening right here in the UK", according to Michael Gove - is going into production right now. But one campaigner who has been banging the drum for improved technology education for years - and putting her ideas into action - has received little recognition. Emma Mulqueeny is the energetic moving spirit behind Young Rewired State, which scours schools across the country for students with an appetite for coding, and brings them together for an annual hack day. She is also behind the e-petition calling for coding to be part of the curriculum, and blogs, tweets and talks with an engaging passion about open data, open government and getting girls interested in technology. On her blog she is generous enough to recognise that the Gove speech is a big step forward - and smart enough to realise that it is just the beginning, and big questions remain about funding, training and organisation. "This stuff does not vanish in a well-intentioned speech," she writes. "Today was great, but it was not enough. " So, congratulations to the coding campaigners. But Michael Gove should not expect them to retire from the fray - they will be on his case for years to come.